Tashana Kirby-Williams at 704-330-6621 ext. 3475 or Tashana.kirbywilliams@cpcc.edu. Need Your Accommodations for Spring 2016 Classes? If you are registered with Disability Services for accommodations, contact your Disability Counselor as soon as you are registered for classes. Students who are registered with Disability Services should follow the “Steps for Students Who Have a Disability Counselor” on our website. We can complete your accommodation forms before the new semester starts. Get ahead of the game by getting your forms done early! Contact your Disability Counselor today! Fall 2014 Semester Reminder! Schedule Your Appointment NOW With Your Disability Counselor if You Need Fall Accommodations! We hope you are enjoying your summer! The fall semester is less than a month away! 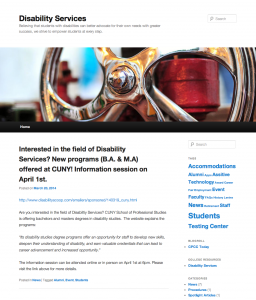 So now is the time to meet with your Disability Counselor to prepare for the fall semester. Your meeting with your Disability Counselor will be focused on signing your accommodation forms for your new classes and discussing any issues that need to be addressed for the fall semester. Please contact your Disability Counselor by phone or email to schedule your appointment. We look forward to working with you in the fall 2014 semester! Alice Carnes, Information about Spring 2014 Accommodations, Scholarship Opportunity for Students with Disabilities and updates to our Testing Center. Q. 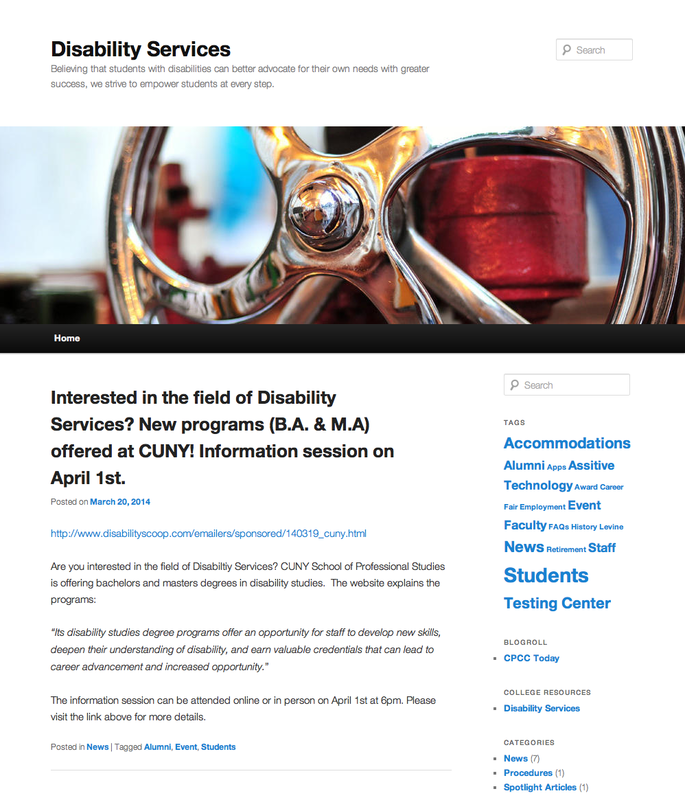 What are some of the academic accommodations that a student with a disability can receive? A. Academic accommodations that students receive are based upon their disability and the impact it has on them in an educational setting. Some of the most common academic accommodations are extended time for testing, low distraction setting for testing, note taking, sign language interpreters, assistive listening devices and adaptive computer equipment. Q. I am having academic difficulty and I am not sure if I have a disability. How am I assessed? A. If a student thinks they have a disability and has not been evaluated, they must seek and pay for an evaluation. The College is not responsible for evaluating students or paying for the evaluation. Disability Counseling has a list of local professionals who administer disability evaluations. The College does not recommend any one particular psychologist. Q. I have a disability, how do I request services? A. Students must self-identify and provide the appropriate documentation to Disability Counseling be eligible for services. The student’s documentation will be reviewed prior to receiving services.